Ticks are arthropods (invertebrates with external skeletons and jointed legs), but they’re neither insects nor spiders. Ticks belong to a special group of mites; all ticks are mites, but not all mites are ticks. The term ‘tick’ is also used botanically to describe certain kinds of plants (such as Tick Trefoil and Beggar’s Ticks) and their seeds that are adapted to adhering to animal fir (and our clothing). The list of ticks throughout the world (and in the U.S.) is impressively long. Fortunately, only a relatively few species are of direct concern to people and our pets. Those who maintain farm animals, work in zoos or travel to exotic locations encounter many other kinds of ticks, and should be aware of how those ticks may affect people and animals. All ticks are external parasites. The tick, itself, cannot burrow into the skin. Instead, only their mouthparts actually enter the skin. 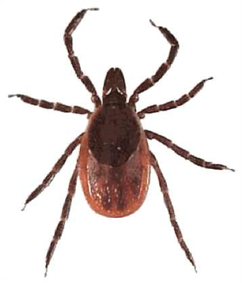 Ticks require a blood meal to develop and to produce eggs. They feed on nothing else but blood. Many have evolved a close ecological association with, and dependence on, their normal hosts and may not even feed upon other kinds of animals if given the opportunity. Ticks that feed on reptiles (lizards and snakes) generally concentrate their bites to those kinds of animals. Similarly, ticks that feed on birds generally do not stray from their bird hosts. In contrast, other kinds of ticks consider virtually any creature with red blood to be ‘fair game’. What we call ‘deer ticks’ (also called ‘black legged ticks’) in the U.S., for example, will readily feed upon deer, but will also feed upon a diverse set of other kinds of hosts. To make matters even more confusing, many ticks have fairly complex life cycles. 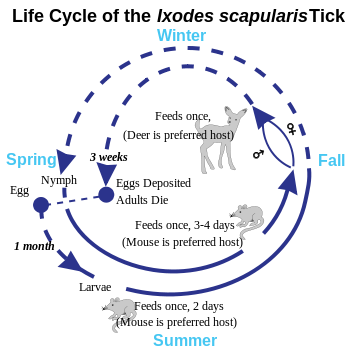 Whereas some kinds of ticks feed during all their life stages on one kind of animal (or even upon the same individual animal), other kinds of ticks switch their preferences as they age. For instance, the immature stages of deer ticks and dog ticks may attack rodents, birds, lizards, deer, dogs, people (and many other kinds of animals), but as adults they feed solely on larger animals. Ticks can be categorized into two main groups, the ‘hard ticks’ and the ‘soft ticks’. Hard ticks have a protective plate on their back that partially restricts the rate at which they can engorge. Hard ticks require many days of attachment to fully feed. In contrast, soft ticks are relatively leathery and lack the protective plate. Soft ticks can engorge much more rapidly, sometimes in a matter of minutes. The tick life cycle begins with the egg that may be deposited on the ground or near the nest of its host. The embryo within develops on nutrients within the egg. The embryo may develop in a matter of weeks or during an interval of many months, depending on the kind of tick and the ambient temperature. The creature that hatches from the egg is the larva. This is a miniature version of the adult, but is endowed with just 3 pairs of legs. This tick will seek a host from which it will obtain a single blood meal. The engorged larva will then digest the meal and develop (weeks or months later) to become a nymph (essentially a ‘teenager’). The nymph is larger than the larva (but not as large as the adult) and will have 4 pairs of legs. The nymph will then seek a single blood meal, and then grow to the next stage. If it is a hard tick, it will transform to become an adult male or an adult female. 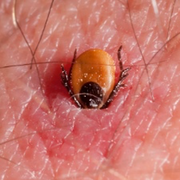 If a soft tick, it may proceed through one or many intermediary nymphal stages before it becomes an adult. A blood meal will be required before each change to the next stage. The adult ticks then mate, and only the female will produce eggs. A single female tick may produce several thousands of eggs from her one blood meal before she perishes. The entire life cycle may be completed within just a matter of months, or it may extend through several years. The deer tick, for example, generally takes two or three years to fully develop, during which it feeds just three times… then dies.